Door Boy is a full service garage door sales, installation and repair company serving the beautiful town of Clinton, New Jersey. 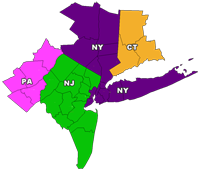 We have been serving the northern New Jersey and Clinton area for over 40 years and we take pride in our garage doors. We are fully accredited with the Better Business Bureau and we are well respected among homeowners and commercial businesses in Clinton, New Jersey. At Doorboy, we take a firm stance in serving our customers with the highest quality service available. We only use the highest grade parts and only the most qualified technicians to install and repair your garage doors. We also provide garage door openers and we will install them for you as well.